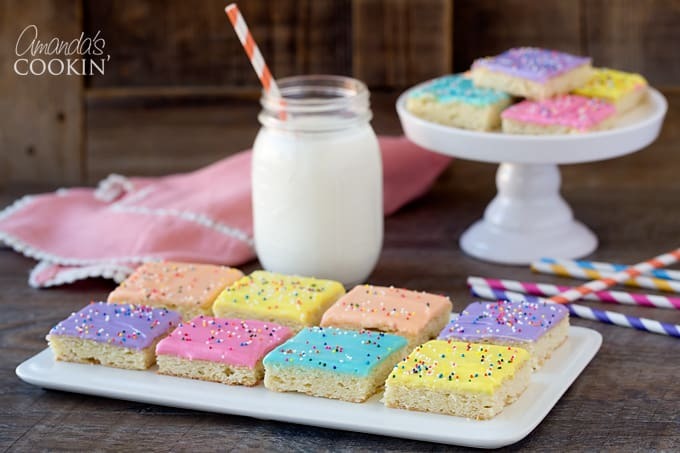 Frosted Sugar Cookie Bars: soft, chewy and oh so pretty sugar cookie bars! 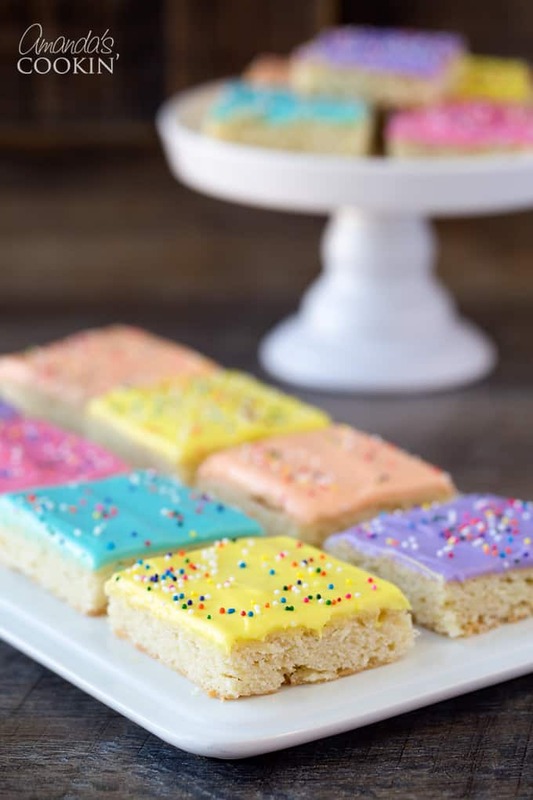 These frosted sugar cookie bars would be perfect for Valentine’s Day, Easter, a birthday or just about anytime. They’re super soft, chewy, colorful and made with love! What more could you ask for in a cookie? 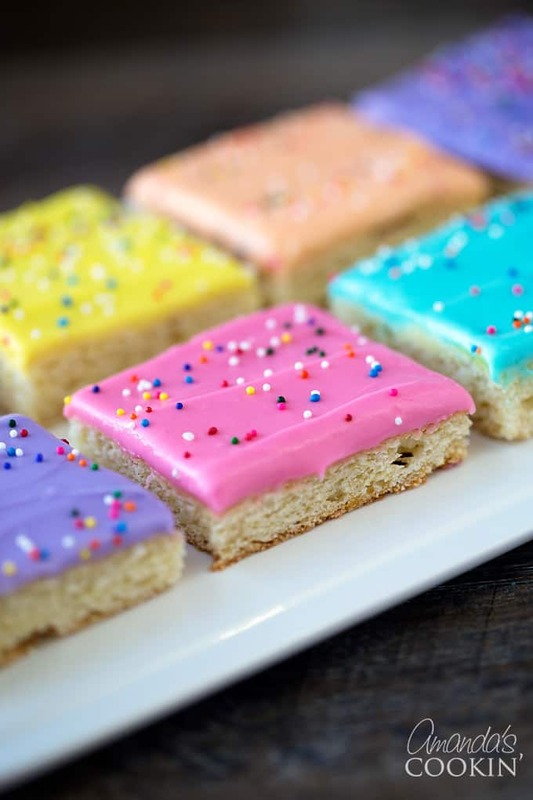 This frosted sugar cookie bar recipe is extra fun because you can mix and match the colors of the frosting to whatever colors you desire making an ultra colorful and pretty dessert! You know those frosted sugar cookies that you can buy at the grocery store? They are usually in the bakery section in a plastic container, two rows of cookies, about 10 or 12 altogether. Each season or holiday they come in different colors and are usually decorated with sprinkles. And they are so good. These bars remind me of those cookies. They aren’t exactly the same, but they put the same smile on my face as those cookies do! 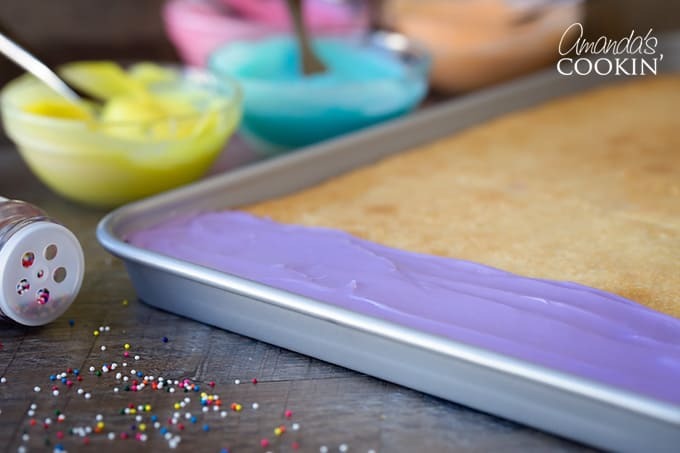 I have seen frosted sugar cookie bars on quite a few different food blogs, but none were of this recipe. This recipe has cream cheese in it and so does the frosting. And it’s delicious! NOTES: I followed the recipe on this, the only thing I did differently was to add more powdered sugar to the frosting because mine was too thin. I also used 5 different colors of paste food coloring. I cut the pan into five sections first using my dough cutter, then frosted one section and added sprinkles. Then I frosted the second section and sprinkles, third section and sprinkles, etc. After all the frosting was added I cut the sections of the frosted sugar cookie bars into squares, again using the dough cutter. In a large mixing bowl or stand mixer beat the butter, cream cheese, sugar, and egg until nice and frothy. About 4 minutes. Add the vanilla and almond extract and beat for 1 minute more. In a small bowl combine the flour, baking powder and baking soda. Mix them around so that all ingredients are well incorporated. Add the flour mixture to the butter mixture and beat for about 2 minutes. Press the dough into a large jelly roll (cookie sheet) pan. Bake at 350 degrees for 20 minutes. Let the pan cool completely. To make the frosting, in a medium-sized bowl (or your stand mixer) combine the butter and cream cheese. Beat for about 2 minutes. Add the powdered sugar, milk, vanilla and food coloring. Mix for 1-2 minutes or until smooth. Frost your pan of cookies using each different color. 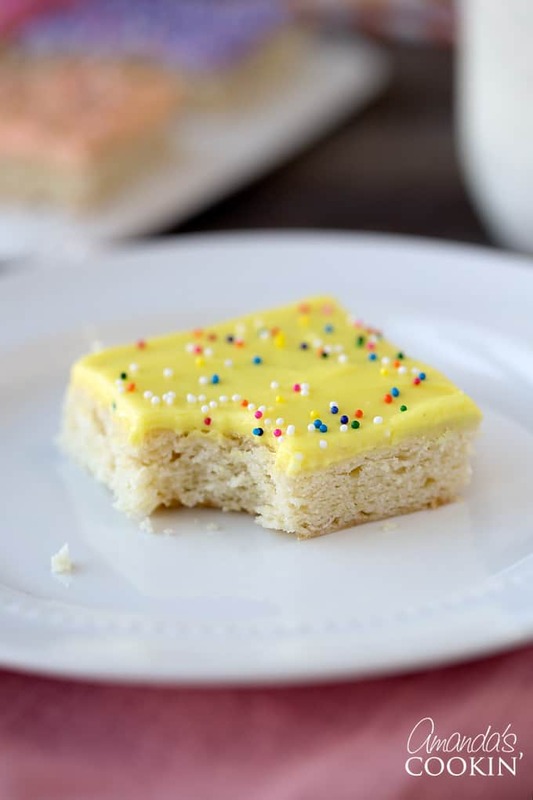 Cut the frosted sugar cookie bars into squares and serve! 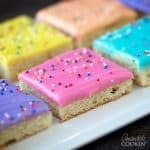 I hope you enjoy these bright and delicious frosted sugar cookie bars! I’ve added them to my favorite bar recipes along with these Fudge Frosted Espresso Brownies and these Peanut Butter Chocolate Chunk Bars! This recipe was adapted from Utah Mama. This post was originally published on this blog on Jan 24, 2011. In a large mixing bowl or stand mixer beat the butter, cream cheese, sugar, and egg until nice and frothy. About 4 minutes. Add the vanilla and almond extract and beat for 1 minute more. In a small bowl combine the flour, baking powder and baking soda. Mix them around so that all ingredients are well incorporated. Add the flour mixture to the butter mixture and beat for about 2 minutes. 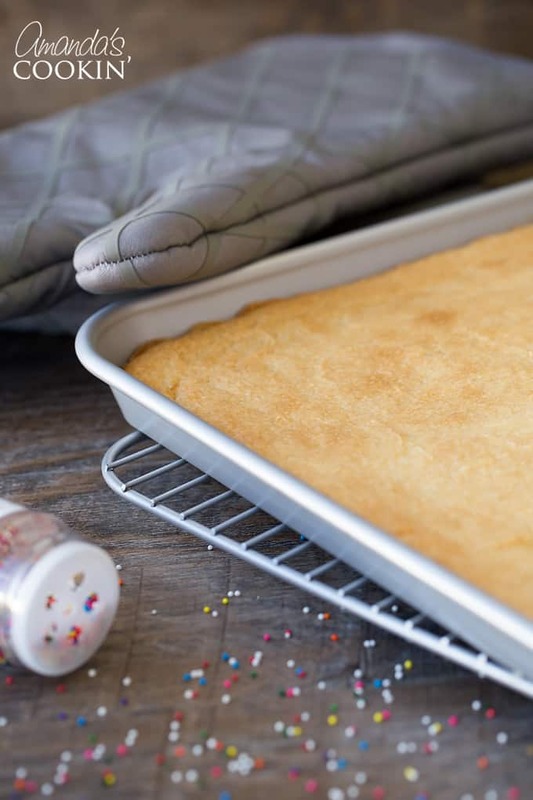 Press the dough into a large jelly roll (cookie sheet) pan. Bake at 350 degrees for 20 minutes. Let the pan cool completely. To make the frosting, in a medium sized bowl (or your stand mixer) combine the butter and cream cheese. Beat for about 2 minutes. Add the powdered sugar, milk, vanilla and food coloring. Mix for 1-2 minutes or until smooth. Frost your pan of cookies. Cut the cookies into bars and serve. Somehow I can’t ever escape your page without a growling stomach. These look SO good and are just so darn cute, too! Pinning! When you say butter in the sugar cookie, do you have to use real butter or can you use margarine? Hi, Sheena. Stick margarine could be used as a substitute for butter, but I would recommend using real butter instead. If you happen to use margarine, let us know how it turns out. I made the cookie bars and they are super good (haven’t iced them yet), but I guess I was expecting more of a cookie texture instead of a cake/bar texture. Did I do something wrong, or are they supposed to be cakey? hi again. i followed the links to your ‘sources’ (although i truly am curious where this recipe actually came from! i really wish others were more like you and gave proper sources…) and it seems that i need to use the larger pan. wow, thats a lot of cookie bars! hi, what size is your jelly roll pan? 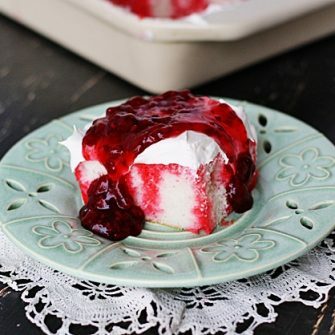 i have two jelly roll pans. one is 10×15 and the other is 12×17… which size did you use? i dont want to end up w bars that are too thick or too thin. id like em to turn out like yours! Great idea and I love the colors! I was goggling around looking for bar recipes. I had baked up a storm for a holiday part that I went to tonight. When I say this recipe at about 3:30pm…I couldn’t resist and since I had everything on hand (except some decorative sprinkles), I made a batch to bring to the party. They were easy to make and were a hit at the party. The only thing I might do is line the pan with parchment…longer than the pan so I can lift the cooked dough out and then frost and cut when it’s out of the pan. They did come out of the pan and looked fine, but I think that would help (me at least) neaten it up. Thank you so much for posting this. I rarely buy store bought cookies, but once a year, I buy those bakery ones that you cite in your write up….I will definitely make these again and think there’s a lot of fun to be had with decorating them for different seasons/holidays. This is where I found the recipe…I remember seeing the Utah Mom but Jamie has these on her website. Thought you’d wanna know. I need to check out everything on your site. Great site! Found you on pinterest! I really want to try this recipe but my husband is allergic to almonds. Should I just leave it out or do you think there is a good substitution? MAKE THESE. I am not kidding, seriously one of the tastiest baked goods to ever come out of my kitchen! I'm so excited, they are sooo good. Didn't change the recipe at all and they turned out great. These are fantastic, I've already made them twice and have never gotten so many compliments!! Thanks everyone! I have a craving to make these again! My BFF made these for me….and they are the best! Thanks for sharing! And then I was on a sugar high! Those look so good! My daughter and I love those grocery store frosted sugar cookies so I'll have to try this sometime (when I'm not dieting)! A nice twist on a classic. The pan with the different colored frosting is so cute. Ok, you are seriously making me hungry….AND I now I'm dying for spring to be here! Wow, these look fabulous. I've never seen anything like them. Must try! Thanks for sharing and for being so careful to give credit where it's due. What a delicious treat! I love the colors too. Reminds me of Spring. Thanks for linking to Tasty Tuesdays! These look really yummy and I love the ease of bar cookies. Very cute! Love all the different colors Amanda! SO pretty! I, too, believe in blogging with integrity! Oh my…cream cheese…OK!! I'll have to try these out soon! Bless you for posting this recipe!! I'm featuring it on my blog. I was attracted first to the colors in the photo – how did you know I was just dying to see pretty, spring colors right now? So lovely! And the recipe…! Sounds amazing! I'd love to make these for my sweetie for Valentine's Day! :-) And I'm sure he'd love them as well! These look delish! And they look like spring! Which…since I have snow all around me, is a welcome sight to see! I am your newest follower! What a cute blog you have! I have a weekly Friday link party if you are interested in linking up, I'd love to have you! Love the look with all the different springy colors. I want spring! ;) I SU'd these. What a fabulous cookie for a kid's valentine's Day party in school. I wouldn't mind a plate of these either. Your cream cheese frosting sounds so much better than my typical sugar cookie glaze. YUM! I agree with you on the giving credit where it is due – it also makes people feel special and important when they are mentioned plus it creates a bigger blogging network. 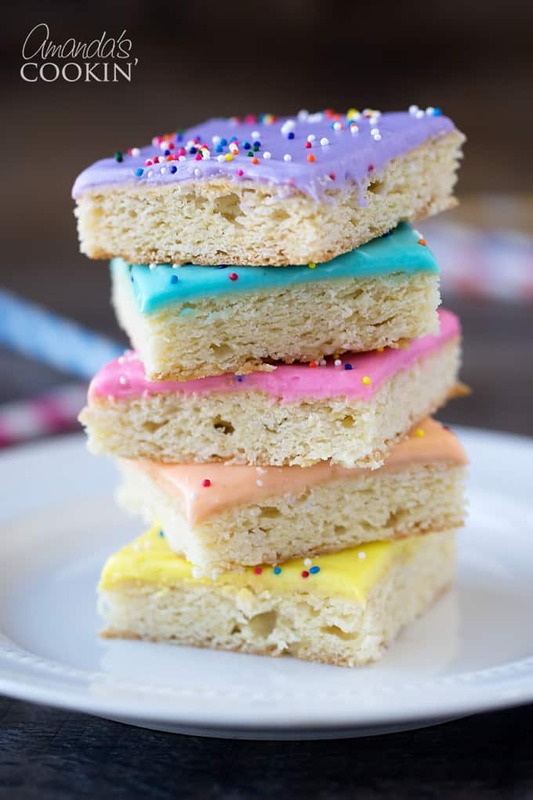 Your cookie bars look just perfect and I love your choice of colours for your frosting. I really think those cookies are like crack, so you've got me hooked on the idea of these bars. Yum! I'd love it if you'd link this up to my new Tuesday linky-Made From Scratch Tuesday. ZOMG! those cookies were so popular with my group of friends in high school that they were called "make out cookies" because they were supposed to be better then making out. 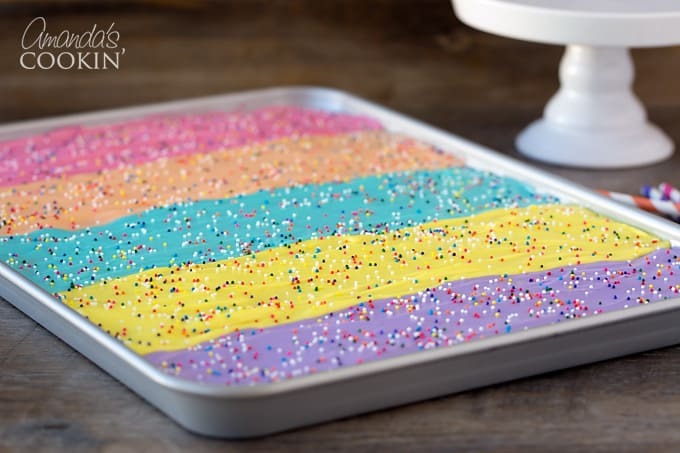 As I was looking at this, I was thinking about all the time it would take to frost each one individually, but then seeing the pan with all of the colors, I breathed a sigh of relief. I love cookie bars (in fact, I have been put on a strict no cookie bar regime by my family for the next few weeks), but these are going on the list for the future. Come on over and link up to my Monday blog "Your recipe, My kitchen" where we feature recipes we have made from other blogs. I love these bar cookies! Amanda, these bars are so pretty. Love those stripes of color in the pan, very smart idea!! These are very eye catching! Love the colors….its making me think of spring which I just can't wait for since I'm waking up in below zero temps this morning (ugh). See ya in Dallas for the Super Bowl!! The picture makes me want to try them. Nice colors! Maybe you could do a St. Patrick's Day version with different shades of green and different green & white sprinkles. My husband would love these! I never let him by the grocery store cookies, so maybe I need to surprise him with these soon. Great colors!